thrilling, unexpected and totally unforgettable! 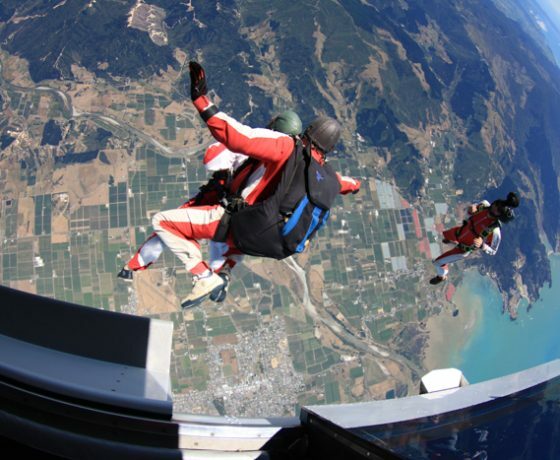 Abel Tasman Tandem Skydive are located in central Motueka, and boast New Zealand’s most epic scenery and we are the only dropzone in New Zealand who can show you the mind blowing views of both the North and South Islands from the best clearest piece of sky this beautiful country has to offer. If you feel nervous, you won’t for long! 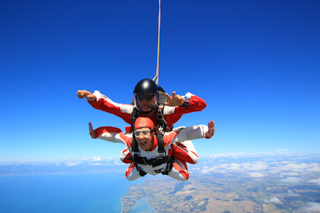 All our jump staff have jumped over a thousand times – well above the minimum 750 required to be a Tandem Master. 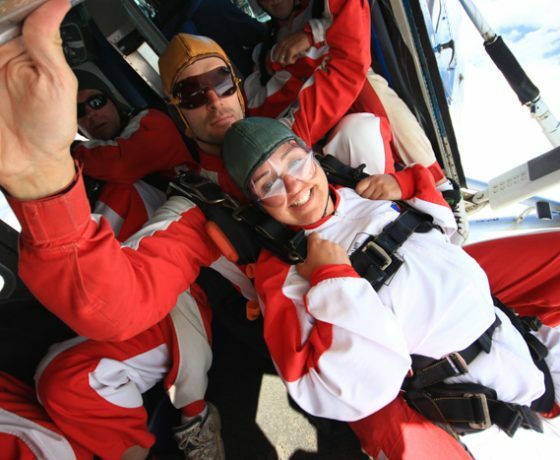 We all know how to make you feel at ease and also have been known to take fun to great heights! If a University Degree for Humour existed, all our crew would have honorary PHD’s. 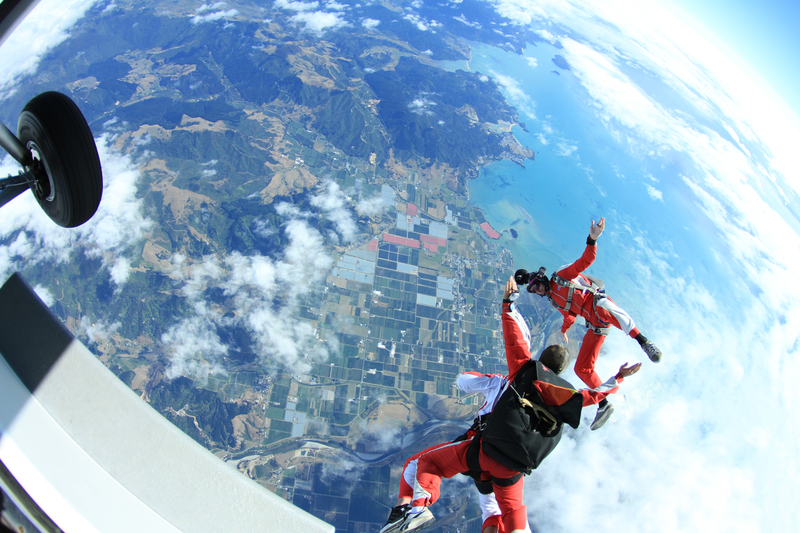 Skydive over paradise at 16,500 ft, one of the highest in NZ. 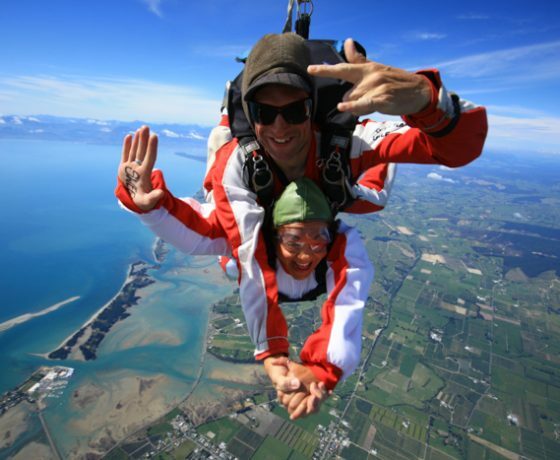 See both islands, jump over 3 national parks, turquoise oceans, snow-capped mountains. 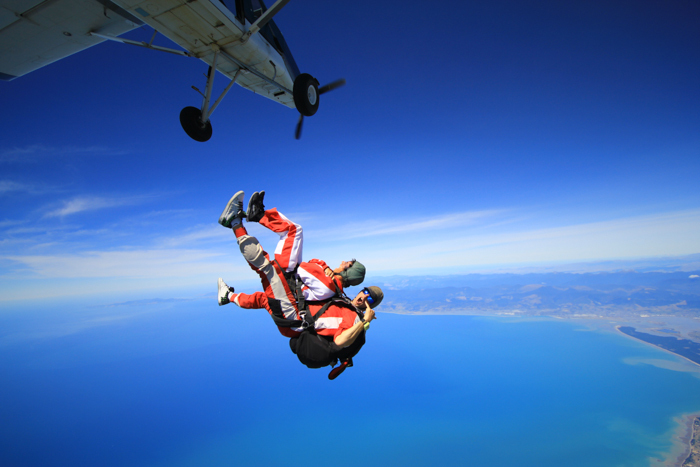 You’ll enjoy a scenic flight climbing to altitude-then the door opens and the adrenaline rushes as you free fall for over 60 seconds. 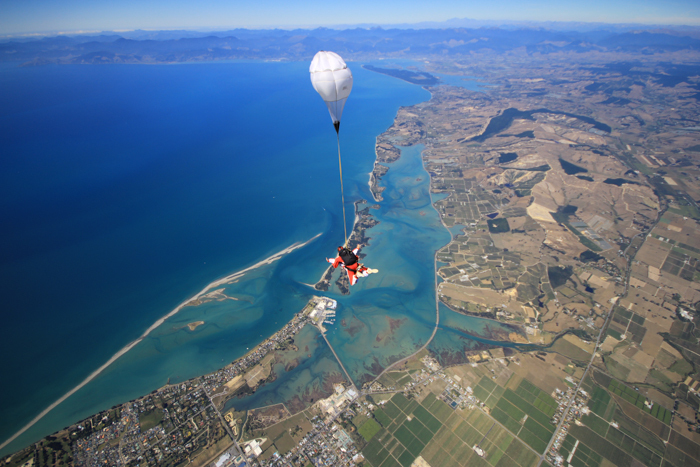 When your parachute opens you gently fly over one of the most beautiful areas in the world. You are in great hands with our friendly staff and stellar safety record. We offer the best scenery, friendliest team and an amazing photography package. Star in your own video and receive over 60 still photos. 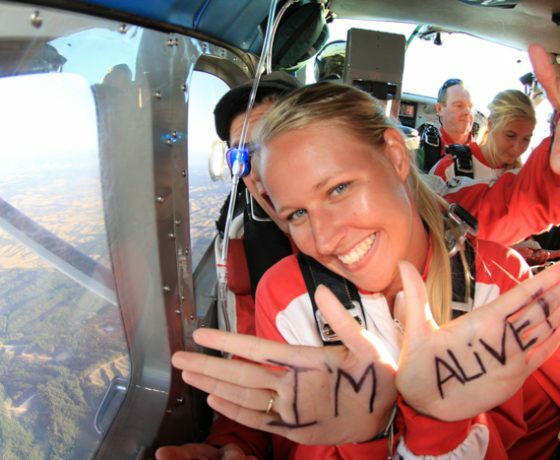 A camera person is assigned just for you; an interview, interaction whilst in the plane, hanging outside the plane to capture your exit moment and free falling with you. They can hold hands and you can dock with another person above the earth. When you land, they’ll be there to capture the smile on your face! Our camera teams are second to none and your video is individually edited just for you. Capture some priceless moments to relive again and again. Check out our reviews on Trip Advisor where we are now a recommended activity! We hope to see you here! 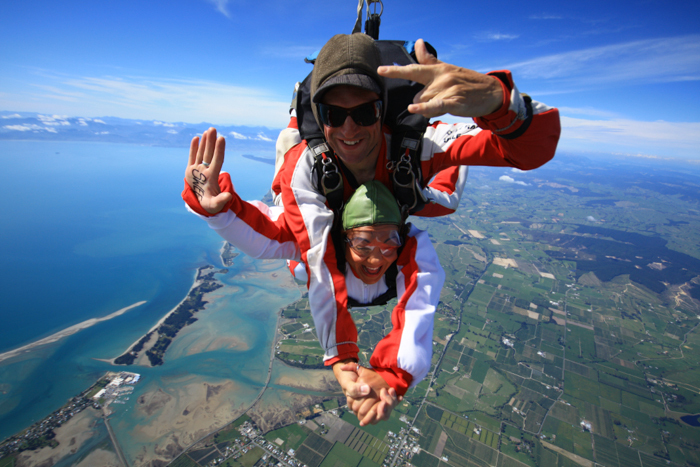 doing what we love Skydiving over the awesome Abel Tasman! 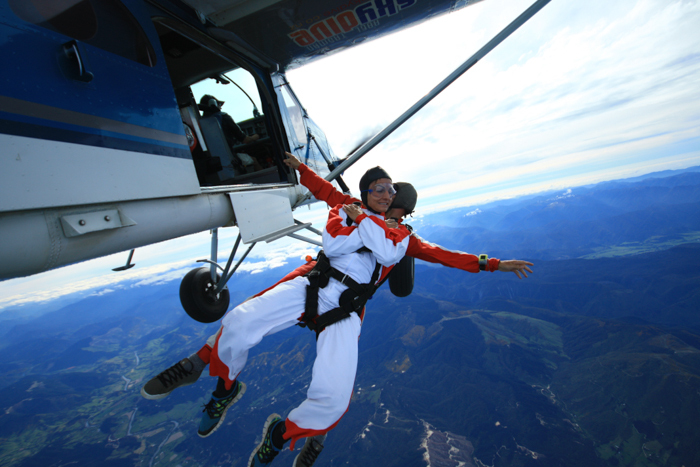 In tandem skydiving, you are paired with a professional tandem master who looks after you every step of the way. 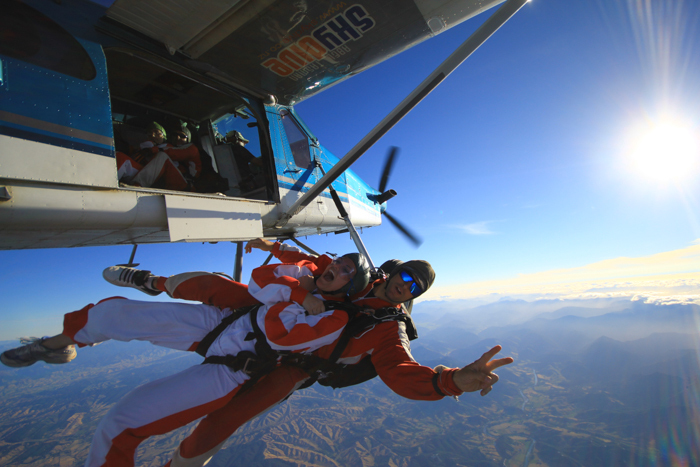 Jumping from 9,000ft you will enjoy a 10 min scenic flight, up to 20 seconds of freefall and then 3-5 min under the parachute. 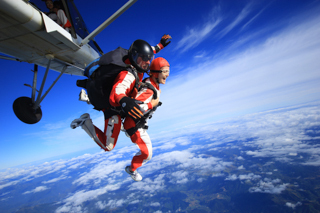 Please select a date and preferred time for your skydive. 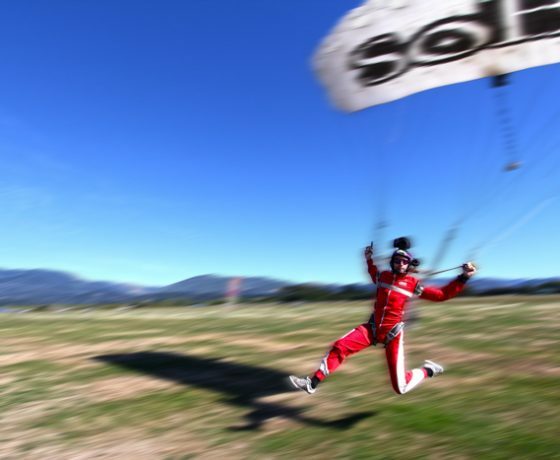 Our friendly staff will contact you within 24hours to confirm your jump time and pickup arrangements (if required). We’ll be stoked to see you and very excited for you! First, we will introduce you to our friendly staff and get you to fill out a small form. 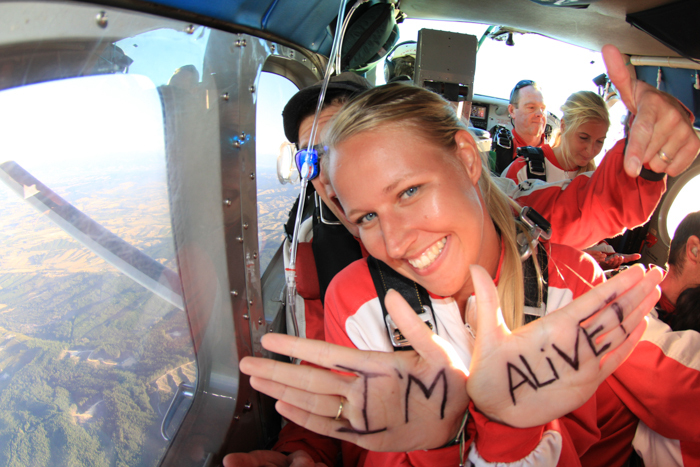 You are now in skydiver mode! 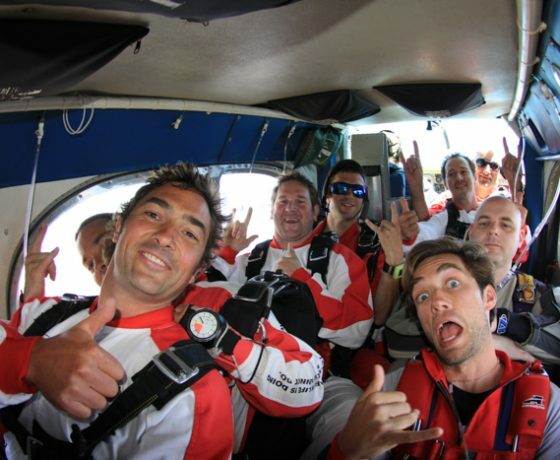 We will take you into our theatre and show you a video to give you a taste of tandem skydiving and our camera production. Then we will explain everything that will happen next, and answer any questions you may have. Chill time! 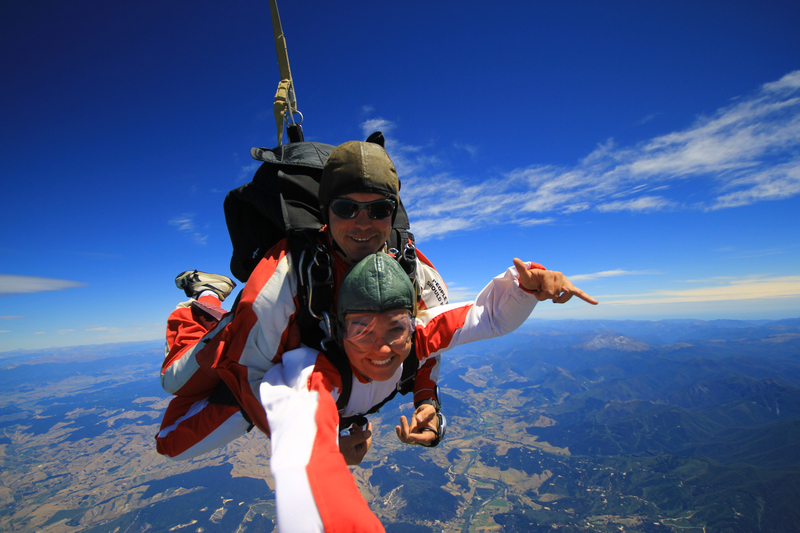 Just relax and enjoy our free WIFI internet and enjoy parachute spotting from the ground! 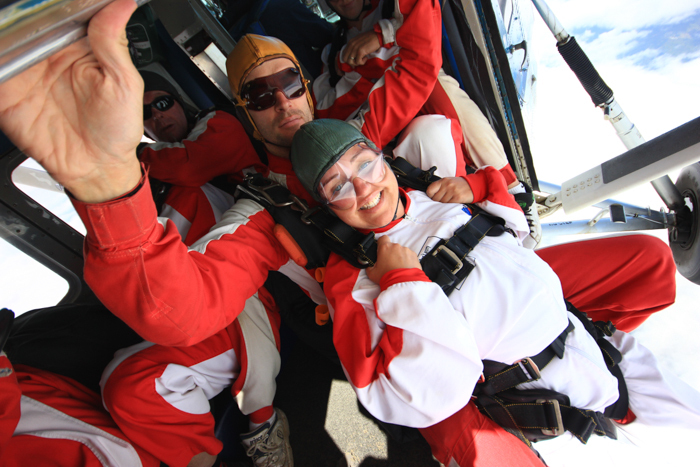 When your turn comes (excitement mounts), you will get geared up into your jumpsuit, harness, hat and goggles. Super cool. Now you meet your Tandem Master! 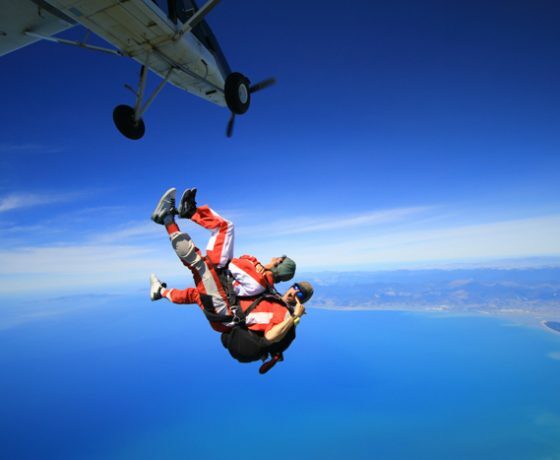 It’s instruction time for your exit and freefall. It’s all very simple and straightforward. If you have a dedicated cameraperson, they will have a quick interview with you on the ground. Yes…it’s really happening! 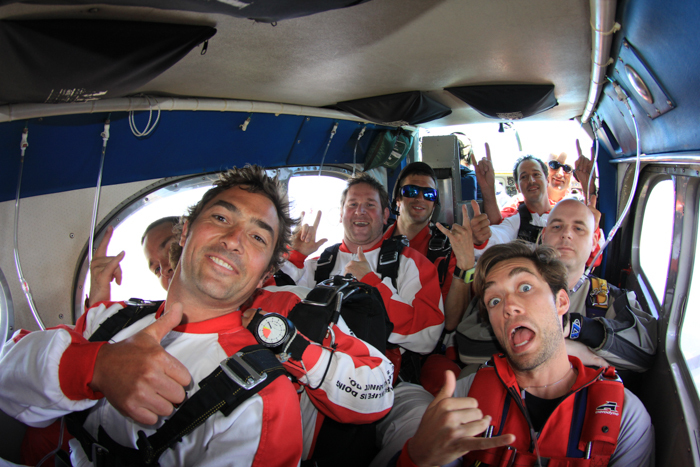 In the plane – the camaraderie really kicks in and any nerves soon turn to excitement. 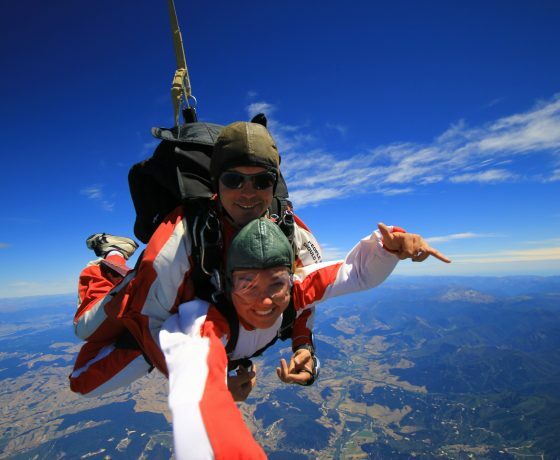 Enjoy the amazing view as your Tandem Master points out the incredible scenery you’re surrounded by. Your cameraperson will also be capturing photos in the plane. You’ll feel like a star! You are! Once the door of the plane opens, you will feel and hear the rush of the wind. 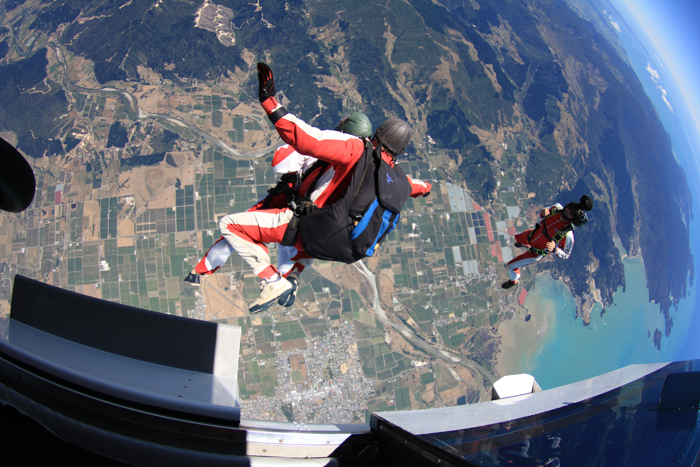 You will see other people exit the plane and your Tandem Master will move you to the door, all connected, and in a few seconds – you’ll be stepping off into an epic freefall experience! 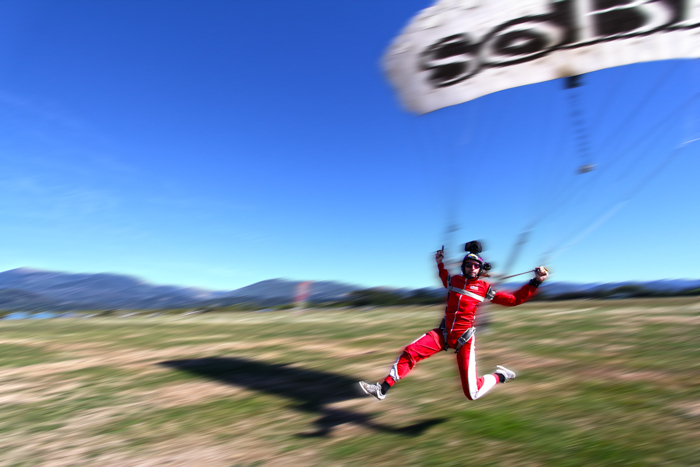 You won’t feel your tandem master on your back, you will feel as light as a feather – but rest assured he is there! 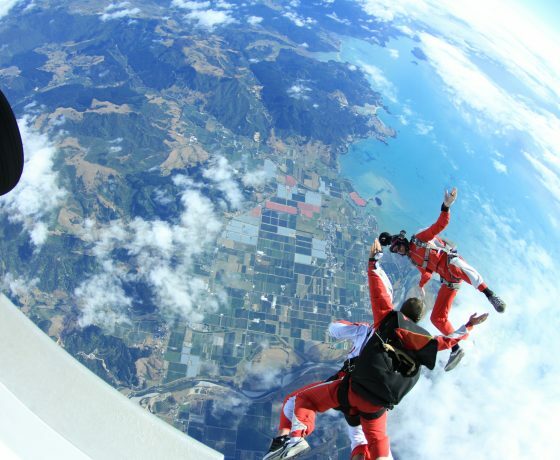 Freefalling is amazing! 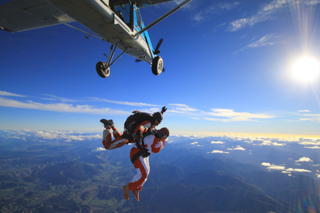 You will experience a huge rush leaving the aircraft – but just as quickly notice that the sensation of the roaring wind below you actually cushions you as you travel speeds of 200kph (120mph). 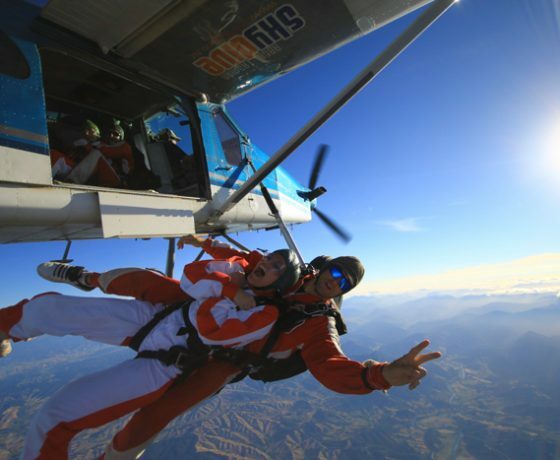 During freefall your cameraperson will be able to come close to you, possibly even hold your hands and capture your facial expressions as you freefall through one of the most beautiful skies on earth. 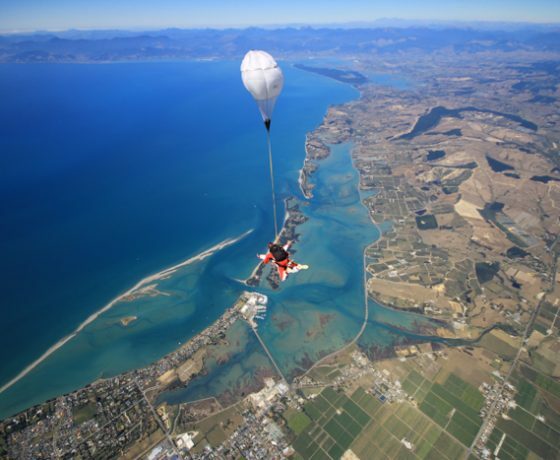 Then wow – the rush turns to extraordinary peace when at approximately 5,000ft, your parachute opens, and you gently drift over the Abel Tasman with breathtakingly beautiful views of the mountains, rivers, and the ocean. At this point, you’ll either be stunned to silence or screaming for joy! It’s an indescribable feeling that you will never forget! 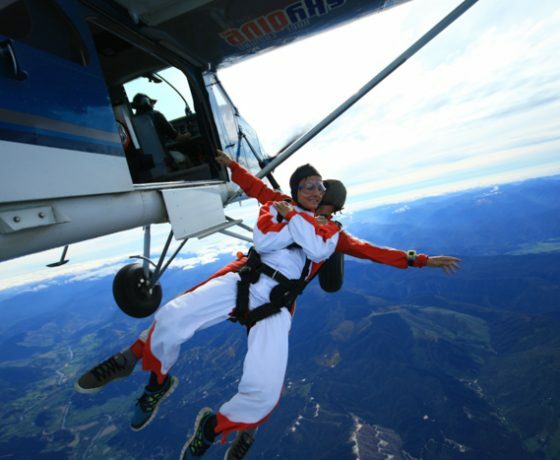 The awesome finale – a soft landing, and an immediate desire to get up there and do it all over again! At this point, what we really love is seeing people unable to wipe the smiles off their faces! This can last for a few days. If you have your cameraperson with you, they will be on the ground to film your landing as we return. Congratulate yourself! You’ve done it! Get Up Here. It’s Epic!